I always look forward to making lentil soup - it will warm the spirit and the heart on a cold night. This recipe was first discovered in the pages of the Women's Weekly Italian Cookbook (Jane). 1. Peel and chop onion, peel and chop carrots, chop celery and chop parsnip (if adding). Mince garlic. 2. Head oil in soup pot and add onion, sauté for 2 - 3 minutes, add garlic, celery and carrots. Cook until onion is transparent. 4. 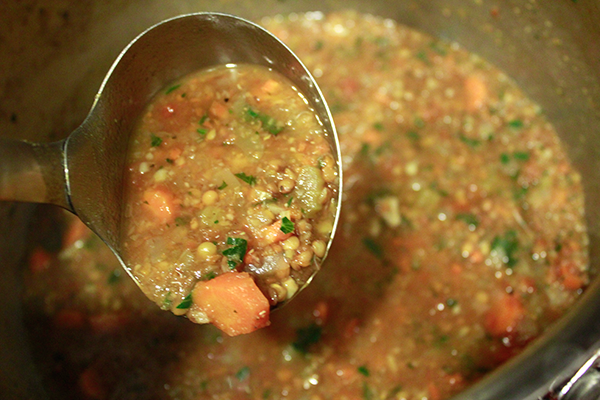 Add washed and drained lentils, crushed tomatoes and water and stock cubes if using. 5. 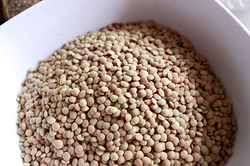 Bring to boil, cover and simmer for about 45 minutes or until lentils are done. 6. Season with salt and pepper, lemon juice and chopped parsley. 6. Use your immersion blender to puree some of the soup before serving. I've recently started to do this and think it's an improvement to an already terrific soup. 7. Serve with crusty bread - garlic toast is good too! Optional: the original recipe calls for adding bacon bones when the lentils are cooking and removing the bones before serving. I prefer making lentil soup for a meat-free vegan dinner. If bacon is your thing, you could always added some chopped bacon as you cook the onions - no need to remove!